Snow Day! Sealed up tight, ready for the approaching snowstorm? Charge your laptop now, because it’s a great time to start writing your blog! Want your blog to grab the attention of your target audience? Here are a handful of great business blogging tips to catch that oh-so-fleeting attention amidst the vast invisible tundra that is the Internet. As the Northeast braces itself for a seriously ridiculous amount of snow, the rest of the nation is hungry for the next news scoop on the weather. Seriously, people can’t get enough of this kind of story. They want to see press conferences from reassuring mayors, pictures of poor souls trying to shovel out their houses and vehicles, newscasters losing their hats and their balance, steeling themselves against the wind, articles on historical similarities from snow times past—all that stuff. When lots of people are looking for the same information at the same time, writing a great, real-time blog post on a current event means your blog is a shoo-in for Internet success, right? Well, no. Write about what everyone’s writing about and you’re sure to be lost in the crowd. Sure, writing about THE IMPENDING SNOWPOCALYPSE SNOWMAGEDDON right now will probably grab some attention. But are you looking for the attention of just anyone, or are you looking to attract a particular segment of the population? When you’re building a blog for your business, you want to attract the attention of your ideal customer or client, otherwise know as your target market or target audience. If the topic is relevant, you need an angle. Will my target market also find this topic interesting? Why? How can I write about this topic in a way that my target market will find relatable? If you can answer those questions with certainty, congratulations! You can now write your blog post! Building your audience is a slow and steady process. It doesn’t happen overnight. Heck, we’re still building our audience here at Posts By GhostTM. Even though we’ve seen huge successes in other markets, we’re aware that building up an entirely new blog audience takes patience. But there are many ways to ensure your audience grows more quickly. The easiest and best way to ensure growth is to make your content EASILY shareable. Social media is an immensely valuable, not to mention FREE marketing tool. So when your current event blog post starts drawing in blog traffic, you need to be ready. A social share WordPress plug-in, such as AddThis. AddThis makes sharing easy—just a click of a button and your readers can share your blog post on Facebook, Twitter, and more. Plus, a variety of other awesome features like social analytics makes AddThis one of my favorites. Using an RSS feed generator like Feedburner to make your blog posts more portable. Feedburner allows your blog readers to read your posts through a variety of feed readers/news aggregators, or even right in their email inbox. No matter the nature of the industry you’re in, or the products and services you sell—your passion (or lack thereof!) will be evident in your writing. You must accurately and adequately convey your enthusiasm for your work and for your blog, especially in the context of this relatable current event. Your timing is crucial, so your writing must be up to par—or you risk losing your audience. And if you can’t write to that? 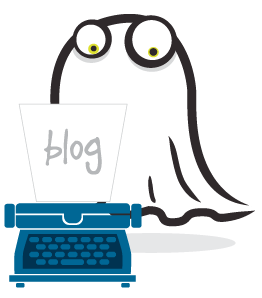 Find a copywriter to help you ghostwrite your blog. A great ghostwriter can help you communicate your ideas, in your voice, just the way you want, and in the way your target audience craves. After all, you’re passionate about what you do, and even three feet of snow isn’t going to stop you from reaching your target market! In short, relevant current events are great blog post topics, but be sure your angle hooks your target market. Make your content shareable and write in your passion, and watch your blog audience grow. Do you write about current events in your blog posts? What’s your favorite social sharing WordPress plug-in? Need someone to help dig out your car? Contact Posts By GhostTM or leave a comment below! Image courtesy Flickr user ***Bud***.